MIRACLE ABC DRINK ... KILLS CANCER CELLS TOO.. This "MIRACLE DRINK" is worth your while to take note. There is a celebrity Mr. Seto who swears by it. He wants to make it public to draw the attention of people who have cancers. This is a drink that can protect bad cells forming in your body or it will restrain its growth! Mr. Seto had lung cancer,He was recommended to take this drink by a famous Herbalist from China. He has taken this drink diligently for 3 months and now his health is restored,and he is ready to take a pleasure trip. Thanks to this drink! It does not hurt for you to try. 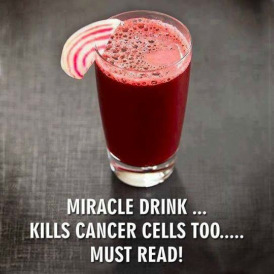 How to prepare this "MIRACLE DRINK"
You need one BEET ROOT, one CARROT and one APPLE that combine together to make the JUICE! Wash the above, cut with the skin on into pieces and put them into the juicer and immediately you drink the juice.You can add some LIME or LEMON for more refreshing taste. Prevent cancer cells to develop.It will restrain cancer cells to grow. Prevent liver, kidney,pancreas disease and it can cure ulcer as well. Strengthen the lung, prevent heart attack and high blood pressure. Good for the eyesight, eliminate red and tired eyes or dry eyes. Help to eliminate pain from physical training, muscle ache. Detoxify, assist bowel movement, eliminate constipation.Therefore it will make skin healthy & LOOK more radiant.It is God sent for acne problem. Improve bad breath due to indigestion, throat infection. Assist Hay Fever Sufferer from Hay Fever attack. There is absolutely no side effect. Highly nutritious and easily absorbed.Very effective if you need to loose WEIGHT.You will notice your immune system will be improved after 2 week routine. Please make sure to drink immediately from the juicer for best effect. Thank's to Gina Morris for posting this recipe.